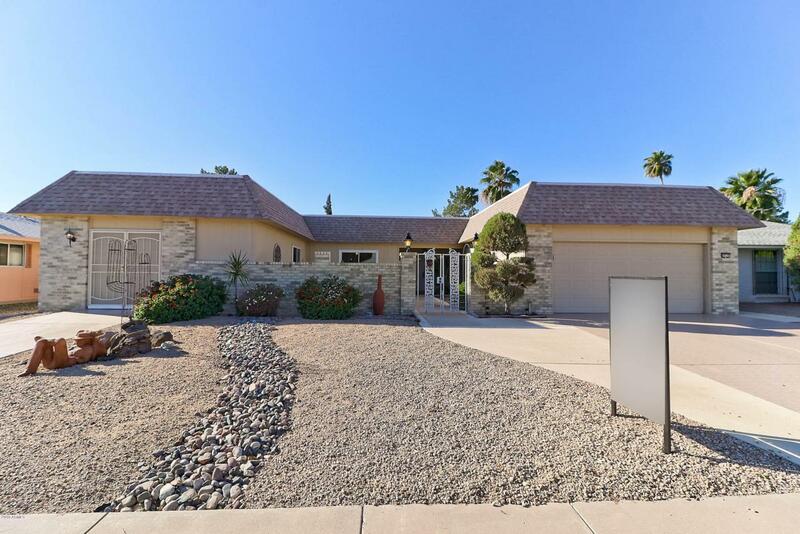 This nicely updated golf course lot home shows light & bright and so open! OWNED (NO LEASE)SOLAR=NO ELECTRIC BILLS Unique casita concept that still allows for the golf cart garage! The kitchen opens up to great room & eat in area & with a eat in bar open to the formal dining. Den with double doors for an additional TV room or bedroom if needed! Gorgeous Arizona room with views of the golf course. 2 bedrooms & bathrooms in the main home & then a brand new bathroom in the casita. In the air conditioned casita the seller kept the garage door behind the new french doors. Room for a guest & your golf cart! True outdoor living w/ a large covered patio. Lemon, Lime & Orange trees in backyard. LiftMaster ''Smart'' garage door opener. New Roof being scheduled March 2019.